Daily HFT Trade Setup - HFT algorithms are selling EURGBP! 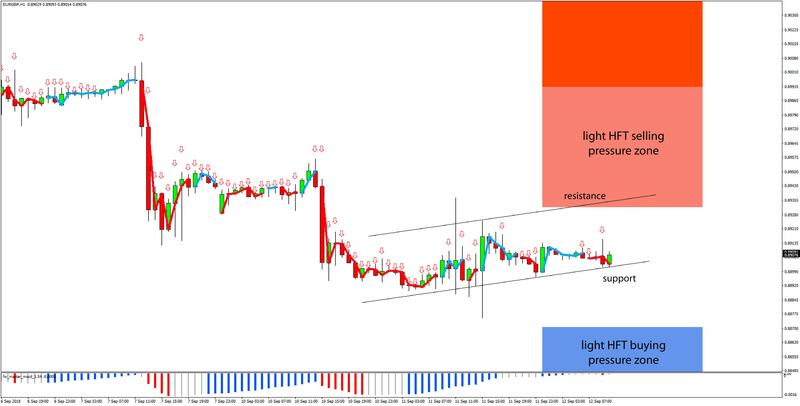 We are analyzing the trading activity in the Forex market this morning and have noticed that HFT algorithms are selling the EURGBP pair and the trend is bearish. EURGBP has been consolidating for the past two trading days in a bearish flag formation and it appears that a bearish breakout may be near today. Resistance stands around 0.8930 and in the light HFT selling pressure zone - noted at 0.8932 and above. Support is at the 0.8900 level where a bearish breakout should indicate the continuation of the bearish trend. The FxTR RSI indicator is confirming the trend as bearish while the faster Master MACD has turned neutral at the moment. Traders can look to enter short positions on a bearish break of 0.8900 with a tight 10-15 pip stop loss and a target toward the light HFT buying pressure zone that is noted at 0.8871 and below.